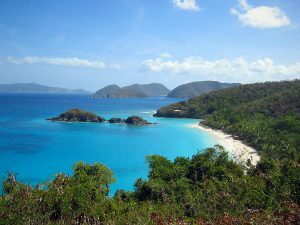 Post Hurricane Irma, both the U.S. and British Virgin Islands have returned to being the same lovely yacht charter cruising area as always, with great protected anchorages, pristine beaches, and beautiful blue green clear water with extraordinary coral gardens below. Boarding to cruise the British Virgin Islands can be in either St. Thomas or Tortola. Often air flights have a better schedule for flights to St. Thomas, but flights into Tortola bring you right into the epicenter of the British Virgin Islands to board your boat, and start your charter without the Customs requirements for clearance from the U.S. to the British Virgin Islands, that a charter start in St. Thomas requires. Either way, besides a few blue tarp roofs left as a parting gift from Irma, this great cruising location is ready and waiting for the winter charter season. 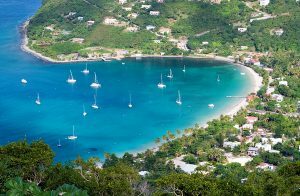 Attached, is a yacht charter itinerary for post-Irma, from St. Thomas to St. Thomas for sailing in the British Virgin Islands. Day 1: Board in St. Thomas and cruise to Maho Bay, St. Johns to anchor overnight and enjoy a refreshing swim, snorkel and water sports. Day 2: Cruise from Maho Bay, leaving the U.S. Virgin Islands to cruise to the West End of Tortola, where Soper’s Hole is located, to clear customs into the British Virgin Islands. The pirate Blackbeard, who real name was Edward Teach, once made his home in Soper’s Hole from 1715 to 1718. Called a “Hole” because of the protection offered by the deep cut of the anchorage into the surrounding hills, the harbor allows yachts to anchor with good weather protection. Soper’s Hole is a good spot to stop while on charter in the British Virgin Islands as the same protection and calm anchorage that made Soper’s Hole attractive to Blackbeard, is attractive to yachtsmen today. Surrounding the dock area are a series of brightly painted Caribbean style buildings that create a sense of a traditional Caribbean market place. Browse the shops for local artwork, crafts and jewelry made from a stone local to the British Virgin Islands, or stop for a bite to eat at the Pusser’s Landing Restaurant and store. 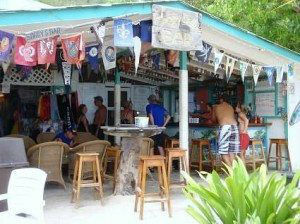 Cruise to Jost Van Dyke to overnight. The Soggy Dollar named for a patron who swam ashore, with money to pay in his pocket; is the original home of The Painkiller Cocktail. Each New Year’s Eve, yachts create a giant raft up in Great Harbour to celebrate festivities at Foxy’s. Although Jost measures just four by three miles, the island is rich in history. It’s been home to Arawak Indians, Caribs, Dutch, Africans and English. William Thorton, architect of the US Capitol, was born on Jost while John Coakley Lettsome, founder of the London Medical Society, was born on nearby Little Jost. Great Harbour is sheltered by small mountains and offers moorings. Visitors look forward to meeting the famous Foxy while enjoying a rum punch. Day 3: Cruise to Cane Garden Bay, Tortola, stopping for lunch perhaps at White Island for swimming on a secluded beach. Arriving by sea to Cane Garden Bay on the northern side of Tortola delights mariners with the colorful buildings and a long, palm tree lined beach. In front of the dinghy dock, located beside Quito’s Gazebo on the eastern part of the beach, are two intimate inns owned by Quito and Malcia Rymer. Quito is a well known BVI reggae recording artist who sings for the after dinner crowd at his inn as well as his restaurant, bar and nightclub, Quito’s Gazebo. As you walk the full length of the beach and peer through the dense brush, you’ll find the real Cane Garden Bay. Visit Myett’s, the two story bar and restaurant and Olivia’s Corner Gift Boutique for native crafts. 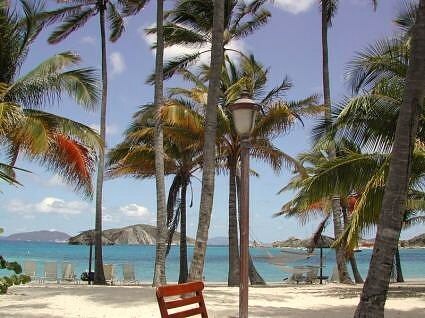 Day 4: Cruise to Virgin Gorda North Sound next to Necker Island for water sports and to overnight. North Sound, once home to the pirates Sir Francis Drake and Sir John Hawkins, was a remote quiet anchorage, rarely visited for centuries. Today there are resorts marching up the hillsides however the anchorage is lovely, calm, and a great location for water sports. Close by is great snorkeling especially on Eustacia Reef, where many ships were wrecked. Day 5: Cruise to the Baths for snorkeling and exploring. The Baths is one of the most well known and popular landmarks to visit in the BVI. 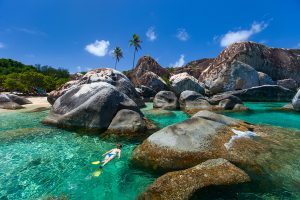 Gigantic granite boulders and half submerged rocks line the southern seashore of Virgin Gorda, creating grottos, tunnels, and arches. Sandy beaches are lined with coconut palms and the area offers a dramatic and lovely place to swim, snorkel and explore. Many yachts anchor right off of The Baths, depending on the waves and swell, and from there guests are taken to The Baths by tender to swim and wander through these huge boulders strewn along the beach. A second beach, called Devil’s Bay, is reached through a maze-like passage through the boulders and shallower grottos. The path is lined with ladders and ropes to ease the hike along steeper rocks. After exploring The Baths, head over to Cooper Island to anchor for lunch. After lunch visit the Wreck of the Rhone for snorkeling or diving. The British Royal Mail Steamer, “Rhone” was wrecked off of the shores of Salt Island, in between Salt Island and Norman Island on October 29, 1867, during a hurricane. The Rhone, built in 1865, was considered by the Royal British Navy to be one of two unsinkable ships, the other being The Titanic, with both ships, unfortunately proving the Royal British Navy wrong. As the waters are shallow, the mast of the Rhone was still to be seen sticking up from the water, until the 1950’s when the Royal British Navy deemed the mast and wreck to be a maritime hazard and sunk the ship further into the waters. In 1967, the area was named a National Park and now is one of the best snorkel and dive sites in which to explore a wreck in the Caribbean. As the wreck is still in relatively shallow waters from depths of 20 to 80 feet, much is seen by snorkelers, and the diving is considered relatively easy. Cruise to Deadman’s Bay on Peter Island to overnight. 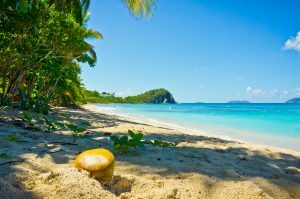 Day 6: Deadman’s Bay is a mile-long, crescent-shaped beach with towering coconut palms that overlook Dead Chest and Salt Island. It’s part of Peter Island Beach Resort and thus, a private and secluded stretch of pristine beach for resort guests. 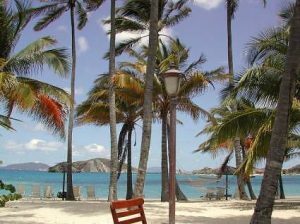 Peter Island Resort’s largest and most spectacular beach boasts protected waters for excellent windsurfing, sailing, snorkeling, and other water sports. 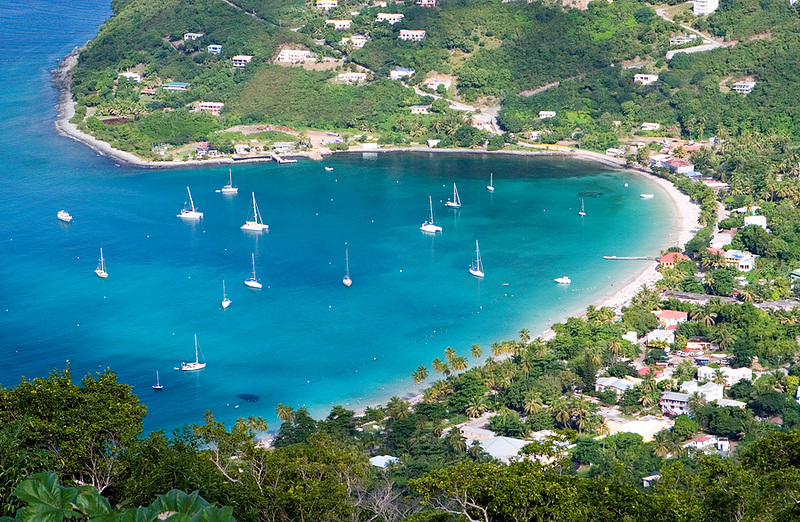 Little Deadman’s Bay and Beach is an extension of its senior and is a great location for windsurfing. Part of the allure of the setting is its history. Directly to the southwest lies Norman Island, the basis for Robert Louis Stevenson’s “Treasure Island.” Just off Peter Island’s glorious Deadman’s Beach is Deadman’s Island-where a marooning inspired the popular poem: “16 Men and a Deadman’s Chest.” These are Peter Island’s neighbors, and that sense of escaping to an (almost) deserted island never leaves guests’ minds. Spa treatments are available at Peter Island Resort if scheduled ahead. After lunch, cruise to the Bight on Norman Island to anchor for an afternoon snorkel to explore the caves from Treasure Isle. Enjoy Cocktails at the Pirates Bight in the Bight. 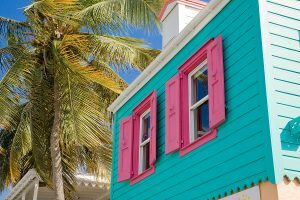 Day 7: Clear out of the BVIS and head back to St. Johns, perhaps Caneel Bay for water sports and then either to a secluded anchorage for overnight or back to Yacht Haven for duty free shopping at the Cruise Ship mall. Day 8: Disembark with duty free shopping in downtown Charlotte Amalie in the am on the way to the airport.